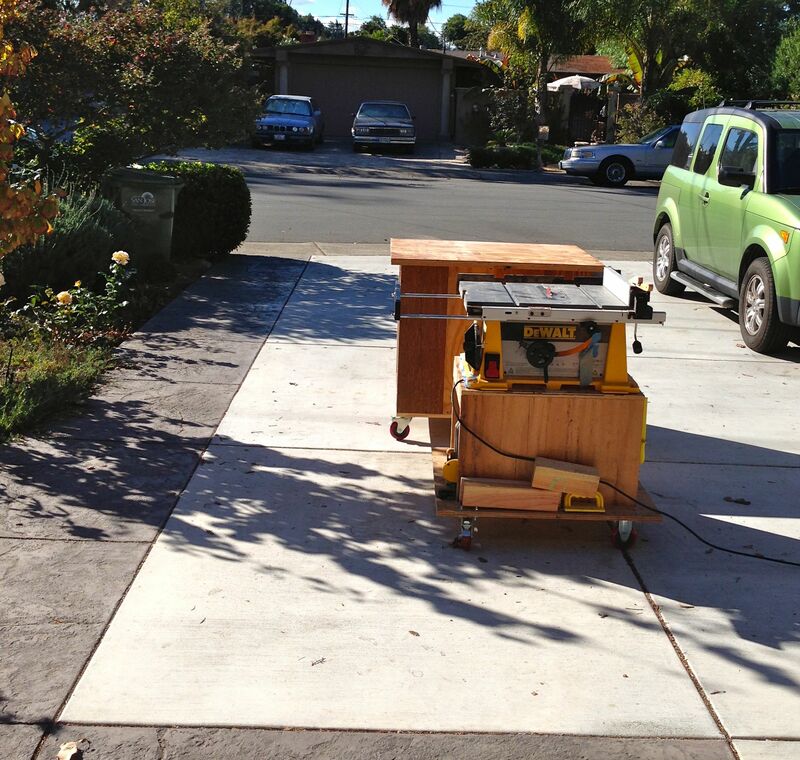 Had great weather this weekend so I took advantage of the sunshine to start a new project: Cat walkways. You see, we built this room for the cats and well, they need more room. Seems kittens grow into big cats. So to give them more room to roam indoors Heather and I had this idea to build wooden shelves and walkways in the cat room that the cats could climb on during the upcoming rainy season (well, if there’s a rainy season here in California ever again). Construction of the shelves starts with ripping some plywood to width and that’s where my new shop cart helps. It’s the same height as my table saw and gives me just enough surface to safely rip a 4×8 sheet of plywood. I’ll post progress pictures of the shelves as I get them done. That is a 4×8 sheet of plywood freshly cut without injury. 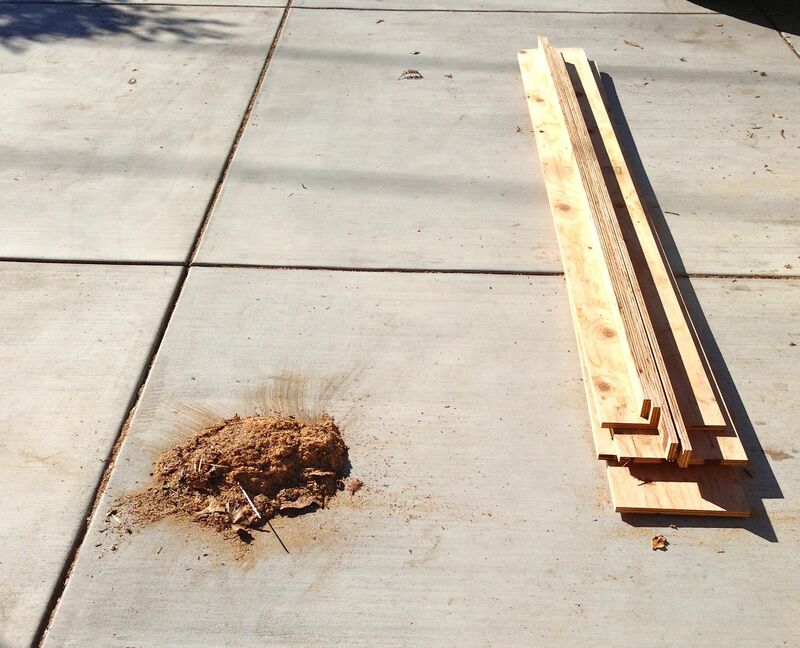 The total output of an hour’s work: One pile of plywood and one pile of sawdust. Next week I’ll have updated pictures of the Celtic heart marquetry. 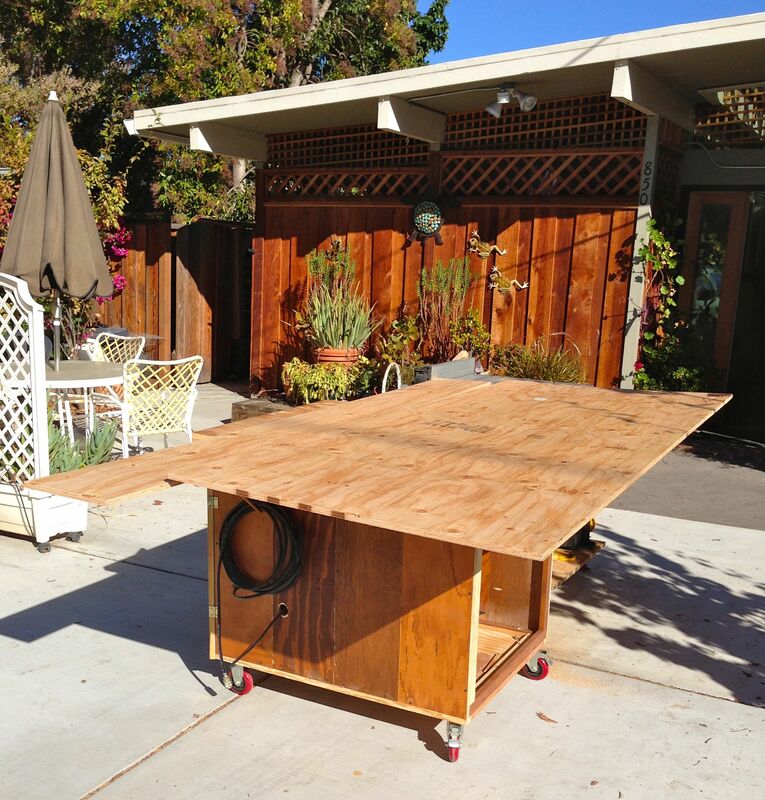 This entry was posted in woodworking and tagged cat shelve, driveway woodworking, ripping plywood, shop cart, woodworking. Bookmark the permalink. With or without rain, I think your cats are going to enjoy having so much room for mischief! I’m hoping they’ll love the extra space. This started all serious, then I read your list of what was included in your setup, and I snorted with laughter. I’m listening to the many versions of Shallow Brown as I browse through your archives. Thank you for following my blog, which led me to discover you! Glad you found me. I sometimes do serious, but can never keep it up for long. Enjoy the music, I love me shanties. Not a word to Tigger about this Andrew. He is still miffed at us because we refused to build the addition to the house for him and his cat tower came from China. His internet prowess grows daily, and I fear he will soon be getting coordinates to your place and take to the road should he hear about these walkways! I am proud to say that after years of woodworking, I am still in possession of all my fingers, toes and limbs. STUPID PART: My worst – was loving my new air-powered brad/nail guns I purchased in 2004…..while “quickly” buidling a window frame, I had my left hand “a little too close” – about 1/2″ while shooting 2″ brads. Yes, my common sense did kick in, but only briefly after pulling the gun trigger (i.e., brain finally shouted out “IDIOT!!!!!! !, PULL YOUR HAND AWAY!” and a micro-second before the PAIN hit my brain, and I screamed out a string of obsentities I won’t repeat here. The brad “skipped” the wood grain and went completely through my left thumb, entering on the right side, under the middle of the finger nail but over the bone, and out the inside. THE REALLY, REALLY STUPID PART: Here I am, bleeding on the garage floor with a brad sticking out both sides of my left thumb. My wife, a trained nurse, was unfortunately away at a doctor’s appointment. My “smart brain” said to go to Urgent Care, some distance away, where I would probably have to wait for an hour or so before the doctor could pull it out, disinfect, blah, blah, blah (as my wife, I knew, would tell me). Instead, my “man brain” (I know, much smaller with questionable location in the body) kicked in and said to skip all that middle part – yep, I grabbed the pliers, held my breath, then pulled that sucker out. I then poured a little rum over it to sterilize the thumb, then drank the rest of the rum to sterilize my inner pain (and/or brain? – if so, which one?)….. Dude, I think I need a bottle of rum after just reading that story. That’s a clever idea. Maybe add a few pull-up bars, a mini-swimming pool? I can see why you love cats–this wouldn’t work with my big dogs (though Casey hates exercise, so it might work fine). And I think I’ve finally earned my, “crazy cat person” badge. Sounds like you’re going to have some pretty happy cats! I am ever hopeful, but you can never tell with cats. They might start living on them or they might just ignore them.